At IIP, we're at the forefront of reflective insulation manufacturing - improving efficiency, product costs, and application. Our reflective insulation and radiant barriers result in significant reduction of energy cost and consumption. By blocking radiant heat, at the industry’s highest rate, our products provide a comfortable environment while providing energy savings. We are here to answer all your questions. Whether they are about product ordering, specifications, delivery or availability, we are determined to provide thorough answers. Furthermore, we are here to guarantee that all customers are satisfied with our products. Our products are built upon years of solid research which we continue in order to lead the industry. From foil and fiberglass insulation research to product application testing, we are determined not only to provide a superior product – today and tomorrow. International Insulation Products offers a wide range of products, and product lines, that address residential applications. From attics to roofs, interior walls to outer walls, we provide insulation solutions that keep homes comfortable while reducing energy costs. As the industry leader in commercial reflective insulation we provide superior products for industrial, metal building, retrofit, and post/frame application. Our manufacturing and market coverage provide solutions at unparalleled quality and affordability. Part of our ongoing commitment to providing superior reflective insulation and radiant barriers is insuring that the products we develop meet not only the industry’s standard but pass our own rigorous testing and quality control at every level of development. Insulation acts as a thermal barrier against heat loss and heat gain. In most buildings insulation is the most practical and effective method to keep structures cool in the summer months and warm during the winter months. Insulation helps to reduce energy use and save money on energy bills. Reflective Insulation fortifies normal insulation by reflecting radiant heat. Properly installed radiant barriers can result in substantial year round savings. Our products are engineered to withstand the stresses commonly encountered during installation and shipping. Many of our products are reinforced with threading that resists tearing and punctures. As a result, installation is not only easier but the risk of losing product from damage is less likely. Furthermore, our reflective insulation continues to stay strong day in and day out providing durability throughout the entirety of the products use. 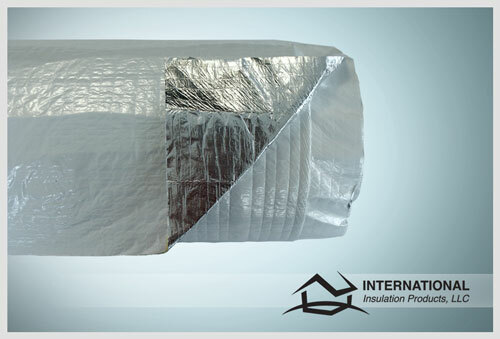 At International Insulation Products we understand the need for superior product performance. Likewise, we understand the need for a product that can withstand the common hazards of a construction environment while also being easy to ship and handle. International Insulation Product's reflective insulation and radiant barriers incorporate polished aluminum facing that blocks radiant heat from the sun. Our reflective insulation utilizes a heat absorbing core that retains heated air during colder weather resulting in lower power bills. By using reflective insulation, temperatures are slower to increase from radiant heat throughout the day thereby reducing peak hour energy rates. Make your home a comfort zone with International Insulation Products. Save money on energy bills while keeping the thermostat at a comfortable level.